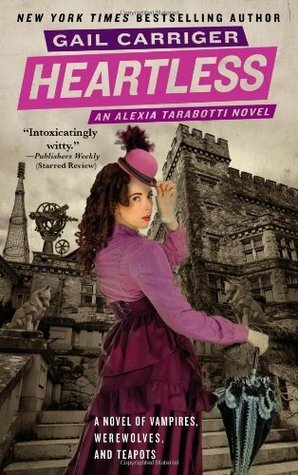 Lady Alexia Maccon, soulless, is at it again, only this time the trouble is not her fault. When a mad ghost threatens the queen, Alexia is on the case, following a trail that leads her deep into her husband's past. Top that off with a sister who has joined the suffragette movement (shocking! ), Madame Lefoux's latest mechanical invention, and a plague of zombie porcupines and Alexia barely has time to remember she happens to be eight months pregnant. Will Alexia manage to determine who is trying to kill Queen Victoria before it is too late? Is it the vampires again or is there a traitor lurking about in wolf's clothing? And what, exactly, has taken up residence in Lord Akeldama's second best closet? Pregnant Alexia is just as fun as not pregnant Alexia, and thank goodness for that, because Alexia is very, very pregnant. Not that that's going to get in the way at all. When a ghost coming precariously close to poltergeist and true "death" threatens the Queen, Alexia immediately jumps into the action seeing as how she is Muhjah, an advisor to Queen Victoria and member of the Shadow Council. There's also the small matter of a very angry group of vampires who are not especially happy that a preternatural is having a baby with a werewolf and a rather depressed Madame Lefoux who has locked herself away on a new invention. Alexia has her hands full, to say the least. No worries folks. We're almost done with the Parasol Protectorate series :) I have had SO much fun listening to this gem of a story. Alexia is a force to be reckoned with, strong, intelligent, and extremely independent. She uses her brain instead of her feminine wiles to get out of scrapes, and her love of tea is unparalleled. Sure there's romance, but each volume is really a mystery rolled up into an adventure smothered in Steampunk finery. The secondary characters are also given much attention, creating a full story and a vibrant world for our heroine to explore (and destroy).